California State Sen. Leland Yee was the subject of death threats allegedly made by a man opposed to gun control legislation. More than two dozens guns were found at the home of suspect Everett Basham, according to search warrants unsealed Thursday. 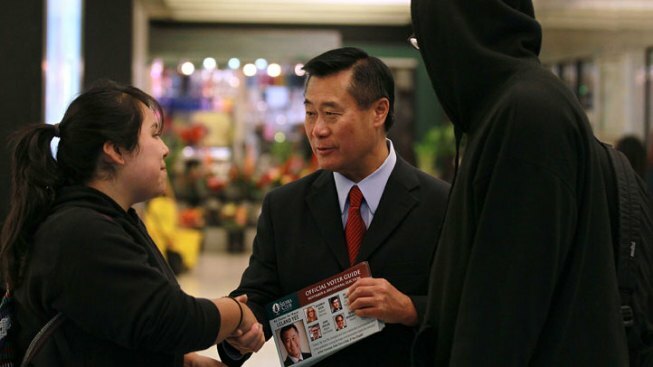 Yee is pictured in November 2011 during his San Francisco mayoral campaign. Police say they found 26 guns, thousands of bullets and dozens of high-capacity ammunition magazines at the home of a Santa Clara man who is charged with threatening to kill a California lawmaker over proposed gun control legislation. Search warrants unsealed Thursday also say authorities found what is described as a homemade destructive device at the home of Everett Basham. The 45-year-old was charged in February with possessing assault weapons, explosives and bomb-making materials as well as threatening state Sen. Leland Yee, a Democrat from San Francisco. The documents do not indicate that police found anything mentioning Yee, the state Capitol or other lawmakers during their search. However, they seized numerous computers, hard drives and cellphones from Basham, who once worked briefly for Apple Inc. co-founder Steve Wozniak, a fact that was first reported by NBC Bay Area. Authorities said Basham, an engineer, objected to Yee's legislative proposal to limit the rapid reloading of assault weapons. Basham, 45, has pleaded not guilty to a dozen charges, including illegal possession of weapons and bomb-making materials, and making criminal threats. He is being held without bail in a Santa Clara County jail. His lawyer, Daniel Barton, did not immediately return a call or an email from The Associated Press on March 13 seeking comment. In the email, the writer said he had killed dozens of people as a trained Marine sniper and threatened to kill again. The U.S. Marine Corps has no record of service for Everett Fred Basham, Maj. Shawn Haney, a Marine Corps records spokeswoman, told the AP. The California Highway Patrol had about two dozen officers nearby when investigators approached Basham on Feb. 12 outside his parents' home in Sunnyvale, according to testimony at a hearing on Friday, the newspaper reported. A loaded 9 mm semi-automatic pistol was found in Basham's car, along with a scope for a sniper rifle, authorities said. The court documents also state that Basham used sophisticated counterfeiting materials to fabricate the credentials of an Army serviceman an identity he may have used as an alias. The CHP contacted the US Army's Criminal Investigation Division and a special agent confirmed that the ID card was a fake. "If you succeed in passing a bill that bans AR15 weapons in California (sic) just know these things,'' the email states, offering a nine-point list that grows increasingly specific. "I can wait hidden for you to walk past my mil dot scope,'' the email states in an apparent reference to a specific type of rifle targeting scope. The message concludes by telling Yee to "Check 6 every day'' a military term for watch your back as well as the Marine Corps motto, "Semper Fi.'' Yee's office declined to comment Wednesday about the unsealed documents and reiterated the senator's previous statement after Basham was taken into custody.